Out of all of the races run in a season, few have such a venerable reputation as the Champion Hurdle. The race, suited to four year old horses and above, is part of the prestigious Cheltenham Festival. At a distance of 2 miles 87 yards and run on the old course at Cheltenham racecourse, the event takes place on the opening day of the Festival in March of each year. The purse for the event is a very healthy £400,000, with £227,000 going to the winner. 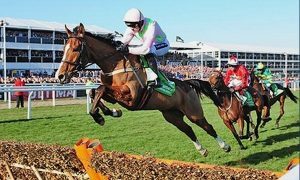 With that in mind, and the attention that the Cheltenham festival draws year on year, it’s no wonder that the cream of the crop show up to compete in this routinely thrilling race. It’s a long way from the very first Champion Hurdle in 1927 when the prize money of £365 was awarded to winner Blaris. This Grade one National Hunt race has the best race horses of their day compete for the crown, resulting in many unmissable match-ups over the years since the race was first run in 1927. Famous names such as Istabraq, Persian War and Lanzarote have all won here. It didn’t take long for the Champion Hurdle to ignite interest with the racing public, with 30,000 fans in attendance on course even in the 1950s. Notable moments over the years include mare Dawn Run winning the race in 1984 (and going on to win the Cheltenham Gold Cup two years later) and the excitement of cheering on what would become one of the race’s three time winners such as Persian War, See You Then and most recently Istabraq who won in 1998, 1999 and 2000. Trainer Nicky Henderson often has a close eye on the Champion Hurdle and it’s paid off, since he’s leading trainer with 7 wins including Buveur D’Air in 2017 and 2018. Buveur D’Air was 4/6 favourites to repeat his 2017 success in 2018 and didn’t let down his supporters. Favourites often do well in the Champion Hurdle, and we have to go all the way back to Panjabi at 22-1 in 2009 to find an outsider taking his opponents to task.